Sometimes you come across a brilliant idea that seems so obvious that it only makes you wonder why you didn’t think of it first. 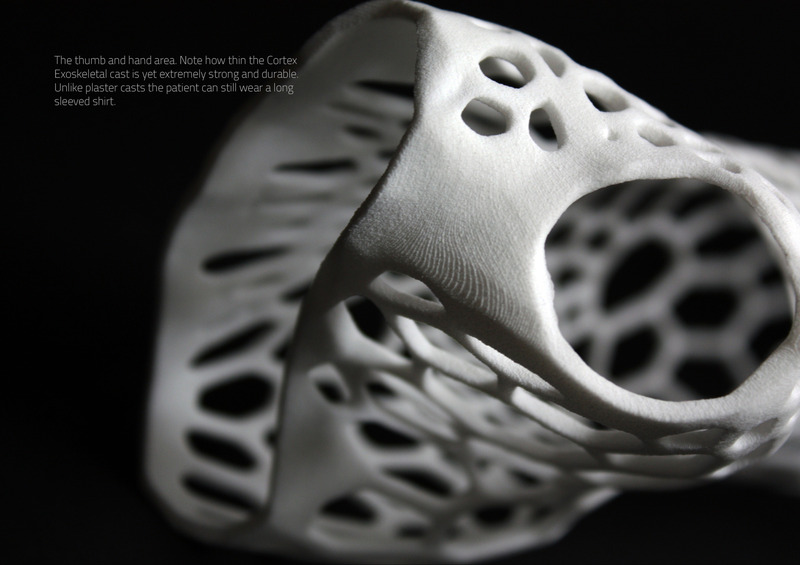 Jake Evill’s Cortex is one of these brilliant ideas where 3D printing really can make the difference. Statistics show that 2.4 people out of 100 are likely to experience a fracture per year. Now, after many centuries of splints and cumbersome plaster casts that have been the itchy and smelly bane of millions of children, adults and the aged alike, the world over, Jake brings fracture support into the 21st century. 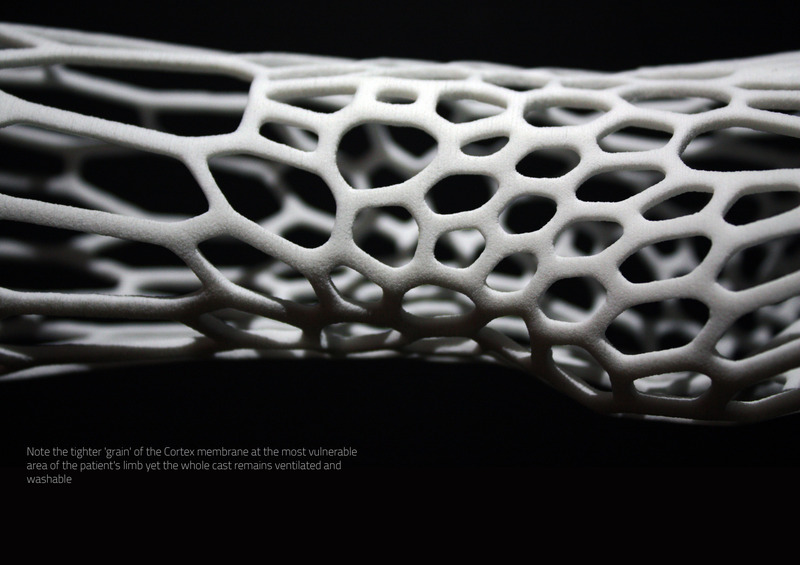 The Cortex exoskeletal cast provides a highly technical and trauma zone localized support system that is fully ventilated, super light, shower friendly, hygienic, recyclable and stylish. 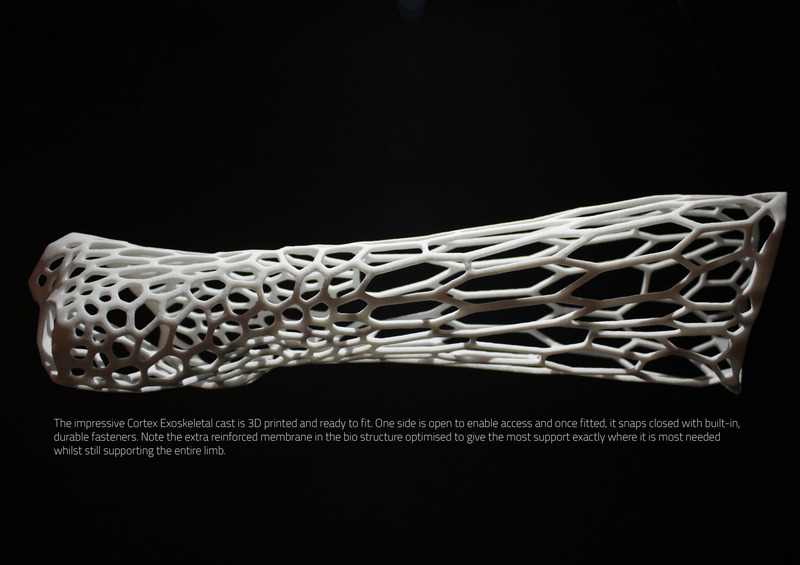 The cortex cast utilizes the x-ray and 3d scan of a patient with a fracture and generates a 3d model in relation to the point of fracture. Normal casts are made out of plaster or fiberglass. Plaster is know to be cheap, low-tech and very moldable. Fiberglass is strong and light. What they do not tell you is that after a couple of days these things start to itch and smell. These casts are not water resistant, not recyclable and heavy. Not really something that fits the 21st century right? So, lets see what the 3D printed Cortex brings to the table. The most important feature is that the Cortex is anatomically accurate. 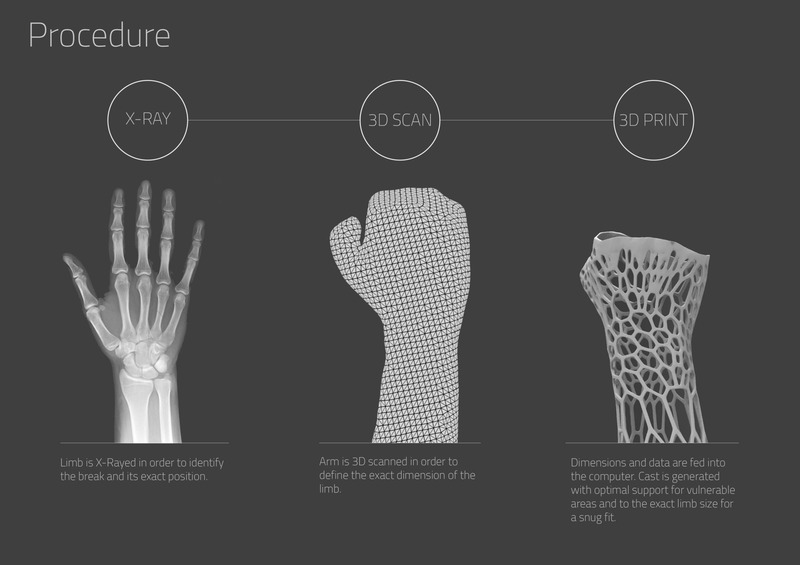 You undergo an x-ray and 3d scan, then the software calculates a pattern for the best fit and optimal support and there you go, your personal, unique exoskeleton! It is strong, waterproof, light, ventilated, hygienic, recyclable, thin, aesthetically pleasing and gives localised support.